DOCTOR WHO - Nods To The Past: Series Four & Specials | Warped Factor - Words in the Key of Geek. 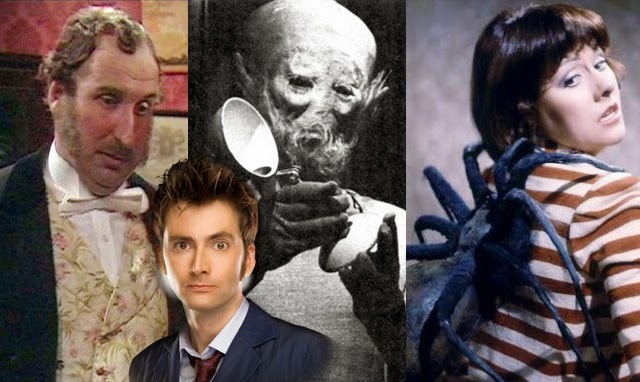 Dan Luisi continues his look back at the many references to classic Doctor Who that are scattered throughout the new series. This time covering Series Four and the 2009 Specials. With three successful years under its belt, from series four onwards the relaunched Doctor Who began referencing the post-2005 years more and more. There had always been story-arcs every season (Bad Wolf, Saxon, etc), but now little in-jokes and nods to the recent past were also included throughout - like the "Are you my mummy?" quote in The Poison Sky. Series four especially pulled in continuity from earlier new-Who years, with the return of multiple characters (Captain Jack, Martha, Rose, Sarah Jane etc) but there were still many classic Who references that you may, or may not, have spotted. This story references the 1964 story The Sensorites, in that the Ood-Sphere is in the same solar system as the Sense-Sphere, which was the location for that First Doctor adventure. 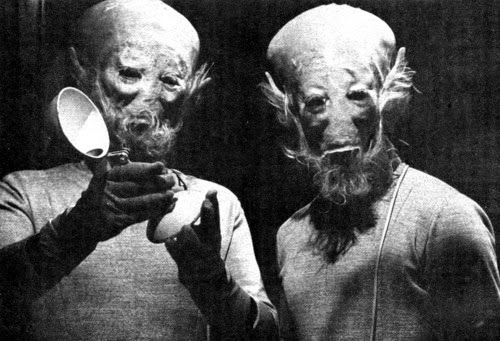 Plus, more obviously, the Sensorites and the Ood are both visually and mentally similar. The Sontarans first appeared opposite the Third Doctor in the 1973 story The Time Warrior, and had last been seen in the 1985 Sixth Doctor adventure The Two Doctors. 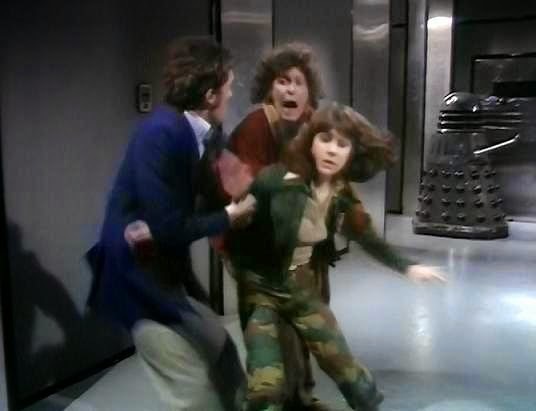 But not only were these classic foes making their new-Who debut, but this episode is also the first major appearance of UNIT since the show's revival. The Doctor mentions the Brigadier, who he is told is stranded in Peru. Played by the late Nicholas Courtney, Brigadier Alastair Gordon Lethbridge-Stewart first appeared in the 1968 story The Web of Fear, and last appeared in classic-Who opposite the Seventh Doctor in Battlefield. Also in this episode, the radio callsigns for UNIT personnel remain "Grayhound" and "Trap" (each followed by numbers), just as they were during all of the UNIT stories during the Third Doctor's era. Although I make no suggestion that she did not get the role off the back of her own talent, it can't be ignored that Georgia Moffett, who plays Jenny - the Doctor's Daughter, is the real life daughter of Fifth Doctor Peter Davison. A clear nod to the past if ever there was one. Christopher Benjamin, who plays Colonel Curbishley in this episode, has appeared in Doctor Who twice before. 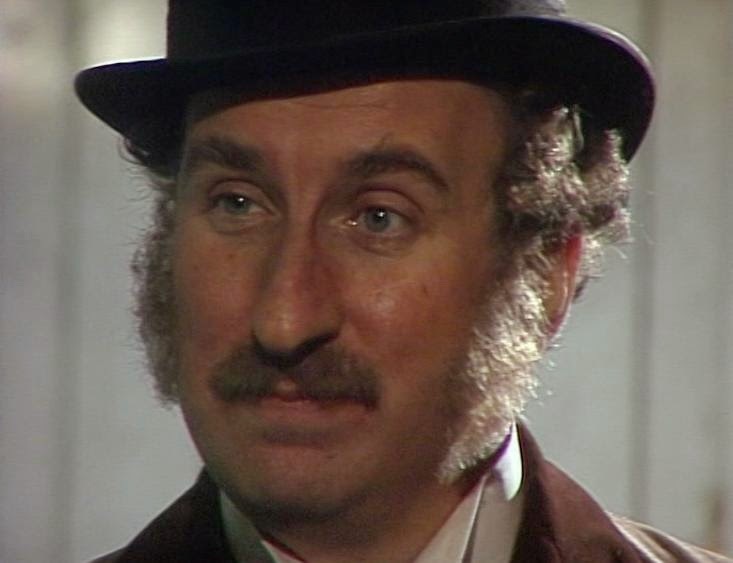 He played Sir Keith Gold in the 1970 story Inferno, but the more interesting nod here is that he was also Henry Gordon Jago in The Talons of Weng-Chiang. That 1977 story being very much Arthur Conan Doyle in theme, and The Unicorn and the Wasp being Agatha Christie. Patrick Troughton's son, David Troughton, appeared as Professor Hobbs in this episode. He'd first featured in Doctor Who back when his father was in the lead role, when he was an uncredited extra in the Second Doctor serial The Enemy of the World. Later, in 1969, he played Private Moor in the The War Games, and he also played King Peladon in the Third Doctor story The Curse of Peladon. "a huge black beetle... shiny carapace, spindly black legs moving and flexing, mandibles clacking together." 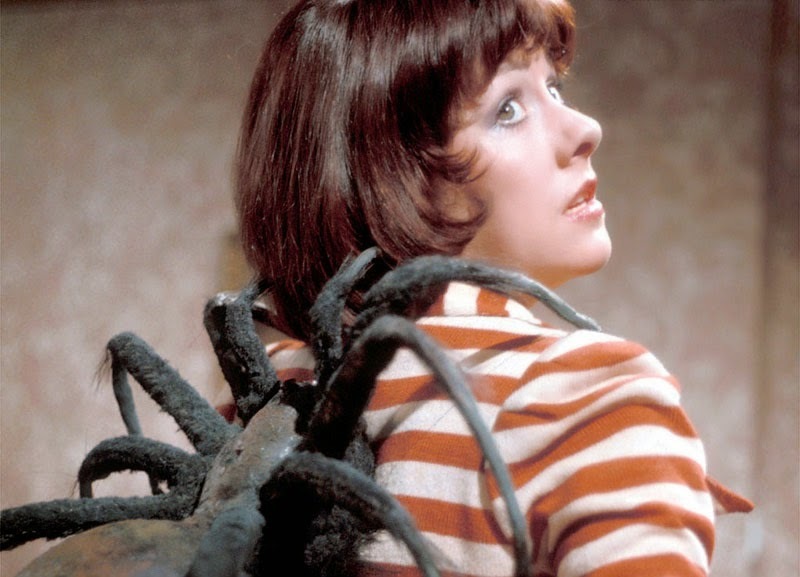 Its design was influenced by the Giant Spider of Metebelis 3 that clung to Sarah Jane Smith's back in Planet of the Spiders. The Stolen Earth includes the first appearance of Davros since the 1988 Seventh Doctor adventure Remembrance of the Daleks. The Dalek creator had debuted thirteen years earlier in the Fourth Doctor story Genesis of the Daleks. This episode also includes nods towards the very first Dalek serial from 1963-64, The Daleks, and the Peter Cushing movies from the 1960s. The scene where Wilfred Mott fires a paintball pellet at the Dalek's eyestalk is a direct reference to the Cushing Dr Who film - and was actually proposed by Bernard Cribbins himself. The Dalek's response to this 'attack' was to evaporate the paintball and reply "My vision is not impaired! ", this was an inverted version of the phrasing used in the first Dalek story. Back then when the Dalek was blinded it said "Vision impaired!". Davros mentions Sarah Jane's presence on Skaro at the creation of the race, a direct reference to Genesis of the Daleks. The Dalek's creator also refers to the Doctor as "The Destroyer of Worlds", this phrase was first used in the novelisation of Remembrance of the Daleks, which states that the Daleks, in their own language, refer to the Doctor as Ka Faraq Gatri, which translates either as "Bringer of Darkness" or "Destroyer of Worlds"
All ten incarnations of the Doctor, to date, appear in this episode through an infostamp projection. Footage of the First Doctor is taken from The Time Meddler; the Second from The Ice Warriors; the Third from Terror of the Autons; the Fourth from City of Death; the Fifth from Arc of Infinity; the Sixth from The Trial of a Time Lord; the Seventh from Time and the Rani and the Eighth unsurprisingly taken from the 1996 Doctor Who television movie. For completion sake, the two new-Who Doctors appear in footage from The Parting of the Ways (Ninth), and The Family of Blood (Tenth). Planet of the Dead was advertised as Doctor Who's 200th story, but writer Russell T Davies admitted that the designation was debatable, and based upon how fans counted the unfinished Fourth Doctor serial Shada, and the season-long fourteen-part Sixth Doctor adventure The Trial of a Time Lord. Davies did not include Shada, and took The Trial of a Time Lord as separate stories, as it "felt like four stories" to him. Which it essentially is, comprising of The Mysterious Planet, Mindwarp, Terror of the Vervoids, and The Ultimate Foe. The Ice Warriors are classic series aliens that originated on Mars long before the events depicted here. In the series' original run, they appeared in The Ice Warriors, The Seeds of Death, The Curse of Peladon, and The Monster of Peladon (the creatures eventually made a return appearance in Cold War). But here, in The Waters of Mars, the Doctor speculates that it may have been the Ice Warriors who froze the aquatic infection to stop it spreading. The Doctor refers to humanity's first venture outside the Solar System as taking place in the time of Captain Adelaide Brooke's granddaughter. In the classic series episode The Invisible Enemy, the Fourth Doctor states that this milestone occurred in the 51st century. However, this contradicted a number of previous episodes where the First and Third Doctors visited human explorers and colonies in other star systems as early as the 25th century, and has been contradicted by many episodes since. Russell T Davies was happily playing with us all, teasing us with the prospect of a classic Who character, when he created the above female character (named simply 'The Woman') for The End of Time. "I think the fans will say it's Romana. Or even the Rani. Some might say that it's Susan's mother, I suppose. I like leaving it open, because then you can imagine what you want." 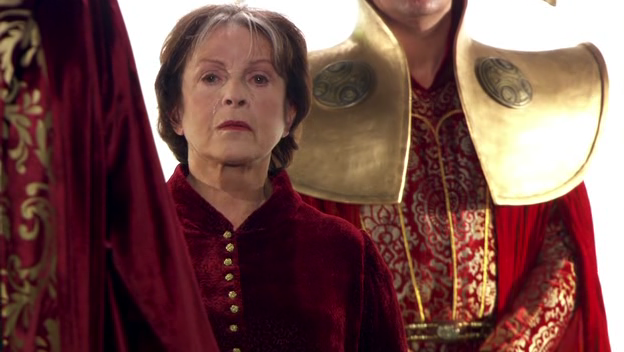 "But of course it's meant to be the Doctor's mother." Also in this episode the Doctor addresses the Lord President as "Rassilon" (although the character is only identified in the credits as "The Narrator" in part one and "Lord President" in part two). Rassilon was first mentioned in the Fourth Doctor story The Deadly Assassin, and first seen on screen in 1983s The Five Doctors. There is one final nod to the past here, the character Verity Newman (who is the great-granddaughter of the character Joan Redfern, from the episodes Human Nature and The Family of Blood, both portrayed by the same actress - Jessica Hynes) is named in a direct nod towards Doctor Who creator Sydney Newman and the show's first producer, Verity Lambert. That's all for Series Four, but please let me know if you think I've missed anything. Next time there's a new Doctor, and plenty of nods to the past, as we look at series five.